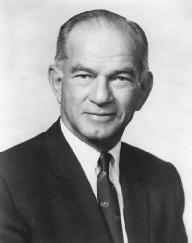 James William Fulbright served as a U.S. senator from Arkansas from 1945 to 1974. Fulbright played an important role in shaping U.S. foreign policy as chairman of the Senate Foreign Relations Committee. His opposition to the Vietnam War and to unbridled presidential power in foreign affairs contributed to major shifts in the conduct of U.S. foreign relations. Fulbright was born in Sumner, Missouri, on April 9, 1905, the son of a prosperous Arkansas businessman. Fulbright was the youngest of four children born to Jay and Roberta Waugh Fulbright. His father was a banker, farmer, and businessman. His mother wrote a column for the family-owned Fayetteville newspaper. He entered the University of Arkansas at the age of 16, and graduated in 1925. From 1925 to 1928, Fulbright attended Oxford University, in England, as a Rhodes Scholar. This educational experience deepened his intellectual interests and provided a strong background for public life. He graduated from George Washington University Law School in 1934, and then taught at that school for two years. In 1936, he accepted a teaching position at the University of Arkansas. In 1939, he was appointed president of the University of Arkansas. At age 34, he was the youngest college president in the United States. His tenure was short, however, as a new governor dismissed him in 1941. Fulbright then turned his focus to politics. As a Democrat he was elected to the U.S. House of Representatives in 1942. In 1945, he was elected to the U.S. Senate. His previous time as a Rhodes Scholar led him to sponsor the Fulbright Act of 1946, 22 U.S.C.A. § 245 et seq., which awards scholarships to U.S. citizens for study and research abroad and to citizens from other nations for study in the United States. The establishment of the Fulbright Scholarship exchange program has proved to be an enduring legacy. Fulbright, although personally a moderate on matters of race, believed in the 1950s that he needed to move to the right on race issues to protect his political future in Arkansas. This led him to sign the Southern Manifesto, a 1956 document signed by southern senators and representatives that expressed their displeasure at the Supreme Court's decision in brown v. board of education (Brown I), 347 U.S. 483, 74 S. Ct. 686, 98 L. Ed. 873 (1954), which struck down state-sponsored racially segregated public school systems, and Brown v. Board of Education (Brown II), 349 U.S. 294, 75 S. Ct. 753, 99 L. Ed. 1083 (1955), in which the Court directed that schools be desegregated with "all deliberate speed." The manifesto condemned these decisions as abuses of judicial power and approved of Southern resistance, by all legal means, to the demand for desegregation. Fulbright doomed his national political prospects by signing the manifesto. In the 1950s, Fulbright became a close friend and colleague of Senate Majority Leader lyndon b. johnson, a Democrat from Texas. In 1959, Johnson engineered Fulbright's elevation to chairman of the Senate Foreign Relations Committee. Following the election of john f. kennedy as president in 1960, Johnson, now vice president, urged Kennedy to appoint Fulbright Secretary of State. Johnson's efforts failed, in large part because Fulbright had supported the Southern Manifesto and racial Segregation. During the Kennedy administration, Fulbright opposed the United States's indirect involvement in the 1961 Bay of Pigs invasion, in which Cuban exiles made a futile attempt to overthrow the premier of Cuba, Fidel Castro. When the Vietnam War escalated under President Johnson, Fulbright became a consistent critic of presidential foreign policy. Fulbright had supported Johnson's Vietnam policy in the early part of the conflict, sponsoring the gulf of tonkin resolution in 1964, Pub. L. No. 88-408, 78 Stat. 384, which allowed Johnson to wage war without seeking a congressional declaration. Within a year, however, Fulbright had become convinced that Johnson had misled him about events that had brought about the 1964 resolution. Fulbright used the Foreign Relations Committee as a platform to criticize Vietnam policy. In January 1966, he held televised hearings on Vietnam. Leading opponents of the war testified that the conflict was going badly and that the United States did not have a legitimate role to play in Vietnam. Fulbright called Secretary of State Dean Rusk to appear three times during the hearings, repeatedly asking hard questions about U.S.-Asian policy. These hearings and additional ones in 1967 gave credibility to the antiwar movement and damaged the Johnson administration's credibility. Skeptical about U.S. foreign policy and the attitudes of those who conduct it, Fulbright criticized policy makers in his books, Old Myths and New Realities (1964) and The Arrogance of Power (1967). His opposition continued during the Nixon administration. "Power tends to confuse itself with virtue and a great nation is peculiarly susceptible to the idea that its power is a sign of god's favor." In 1974, Fulbright was defeated by Dale L. Bumpers in the Democratic primary election. He served as a Washington lobbyist following his defeat and remained active in the Fulbright Scholarship program. In 1993, President Bill clinton awarded to Fulbright the Presidential Medal of Freedom, the highest award given to a civilian by the federal government, in honor of Fulbright's dedication to public service. Fulbright died of a stroke in Washington, D.C., on February 9, 1995. Woods, Randall Bennett. 2003. J. William Fulbright: A Biography. New York: Oxford Univ. Press. O'Neill, William L. 1971. Coming Apart: An Informal History of America in the 1960s. New York: Quadrangle Books. Cuban Missile Crisis; Vietnam War.